Pass the wine – or maybe that should be pass ON the wine. One Brooklyn man explains that you certainly don’t have to pass on his wine, even though he’s cultivating an enormous 50 foot grapevine right by the polluted waterways of the Gowanus Canal. Well that certainly puts my mind at ease. Mariano, 73 and a retired computer programmer for the Department of Environmental Protection, has labeled his wine Vinum Nostrum. Latin for “Our Wine,” the wine has, as Mariano describes it, a “unique flavor.” Mariano gets his love of wine-making from his grandfather, Angelo D’amore of Bushwick, who also enjoyed the art of winemaking. 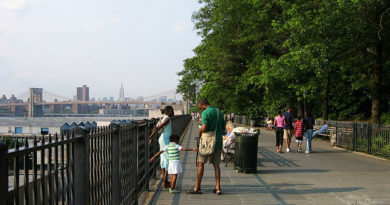 Mariano first planted the Delaware-variety grapes in 1976 when he moved to the Gowanus area. His three story vine is lowered to the ground with pulleys each August for harvesting. 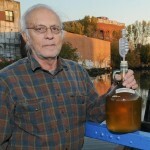 The local soil gives a fruity flavor to the light-brown colored Gowanus wine. Each year, the 20 pounds of grapes that he harvests create about five bottles of homegrown wine that are given to friends and family and enjoyed in-house. And that’s probably a very good thing. Picture by J.C. Rice for the New York Post.